Western Force is a rugby union team based in Perth, Western Australia playing in the international SupeRugby competition. They first competed in the 2006 season and finished with the wooden spoon in that year, however their performances greatly improved in 2007. In 2008 they finished in 8th place, just missing out on the finals again. The team is the fourth Australian team to be accepted into the competition. It was coached by former New Zealand All Blacks coach, John Mitchell for the first five seasons before former Australian Sevens Captain Richard Graham took charge ahead of the 2011 season. On 19 April, RugbyWA unveiled the franchise team name as well as the logo, at a reception at the Burswood International Resort in Perth. Months of detailed community involvement went into selecting the name for the team. 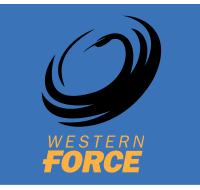 'Western Force' was chosen as the name, which best reflected the franchise's location (state) and its 'values of strength, energy and community'. The logo was unveiled to be a black swan, which is the state's traditional insignia. The swan is set in a blue background, representing the Western Australia coastline and sky, whilst the gold represented the beaches, mineral wealth and sunshine. Some speculated that the team was going to be called the 'Black Swans'. In July at function at the same venue as where the logo was unveiled to the public, the Force's jersey and naming rights sponsor was revealed. The home jersey was unveiled on Brendan Cannon, being blue with a black swan. Lachlan MacKay emerged with the side's alternate strip, which was gold with a black swan; black and gold being Western Australia's sporting colours. The team's first jersey was auctioned off for $30,000, and the first alternate strip was then also auctioned off for $30,000 as well.